I wanted to showcase this very fun and versatile stamp set before its no longer available. The Waterfront stamp set can be used so many ways and I thought I would show you a few ways I used it recently for the design team I have been a part of. My first example started out as an entirely monochromatic theme in shade of blue. I used watercolor paper, and after sprinkling Prussian Blue Brusho Crystals directly on my stamp, I then spritzed water lightly onto my paper. I then stamped the pre-brusho’ed stamps onto the damp paper and voila! Here is an interesting tip…Prussian Blue Brusho and Dapper Denim ink are very close to the same shade of blue! I did some shading and brush work with my Aqua Painter to get the watercolor effect and also used a sponge to deepen the colors around the edges. 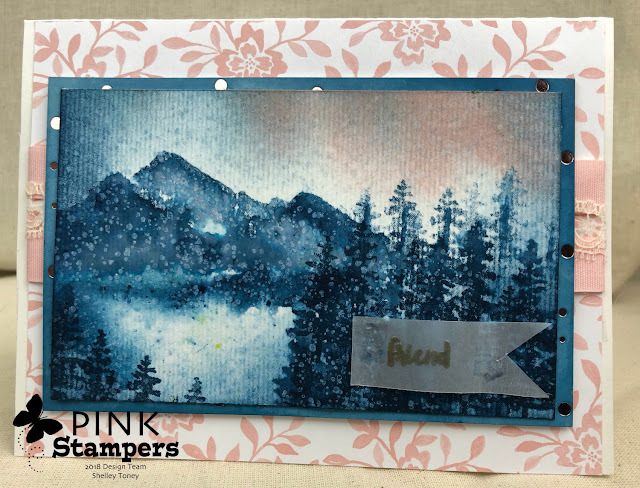 I was going for a moody, snowy day look, but wanted to break up the monochromatic so added a touch of blushing bride to the sky and followed up with some backing paper that flattered that pink. I then used the “snow” stamp to cover the entire image with snow using White Craft ink. A little tag of vellum over the top, and the card was complete! I will have more examples with this stamp set in the next few days. Tell me what you think!! 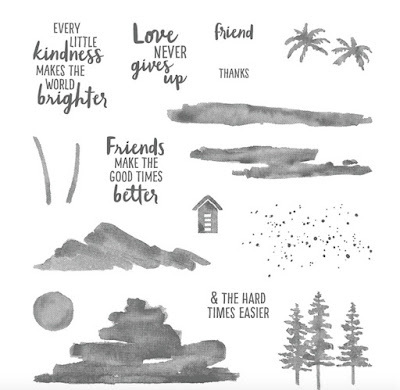 Sale-A-Bration is one of Stampin' Up! 's biggest sales of the year! Through March 31st, for every $50 USD you spend, you'll receive a free Sale-A-Bration product. For anyone who has enjoyed Sale-A-Bration in the past, we have an exciting new announcement for this year: We now have a new reward level, giving your customers more flexibility and options for their free items.